Prunus Accolade H/W 1.0m ? Current Stock Height: STD-100/HGT-150 cm ? New stock arriving beginning of July, 2019. Pre-order now. Estimated price $46.99 each. Payment when stock arrives. Prunus Accolade H/W 1.5m ? Current Stock Height: 150/190 cm ? Prunus Accolade H/W 1.7m ? Flowering Cherry. Add a touch of softness in spring with this outstanding flowering cherry that has masses of semi-double rich pink blossoms in pendulous clusters in spring. Open spreading habit. Vivid autumn colours. Easy to grow in well drained soil. Deciduous. RHS AGM. Upright Flowering Cherry. A popular street planting tree because of its narrow columnar habit. Clusters of fragrant, semi-double, shell-pink blossoms smother the tree in mid spring. Fresh bronze-green spring foliage turning bright green for summer. Deciduous. Est.10yr.growth. The Japanese name Amanogawa means 'Milky Way' describing the tree in full bloom. The Royal Horticultural Society have given this tree an Award of Garden Merit. Current Stock Height: 130/150 cm ? New stock arriving beginning of July, 2019. Pre-order now. Estimated price $44.99 each. Payment when stock arrives. An unusual flowering cherry in that it will start flowering in winter if the temperatures are mild. The main display of dainty semi-double blush pink flowers is as expected in spring and is not at all diminished by the early start. Plant in a sunny well drained spot. Deciduous. Est.10yr.growth. Current Stock Height: STD-150/HGT-210 cm ? 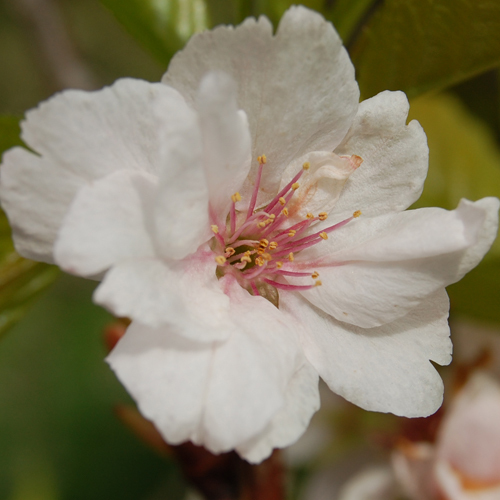 Prunus Avium Pendula 1.8 H/W ? This weeping cherry would look fabulous as a feature tree with its semi pendulous habit abd abundance of white/pink cup shaped flowers borne in clusters. An impressive sight in full bloom. Current Stock Height: 180/200 ? Prunus Awanui H/W 1.5 ? Raised in NZ, 'Awanui' is a little different from other flowering cherries in that the horizontal branches drape softly almost to ground level. The prolific spring blooms are softest baby pink and single. A tree in full blossom is extremely pretty. Definitely a must have. Deciduous. Current Stock Height: 160/230 ? Prunus Awanui H/W 1.8 ? Current Stock Height: 190/260 cm ? Current Stock Height: 200/250 cm ? Current Stock Height: 240/260 cm ?